One more oppurtunity to go long in nifty? You are here: Home / Futures and Options / One more oppurtunity to go long in nifty? Nifty once again nears the EOD support zone 5000-5020. 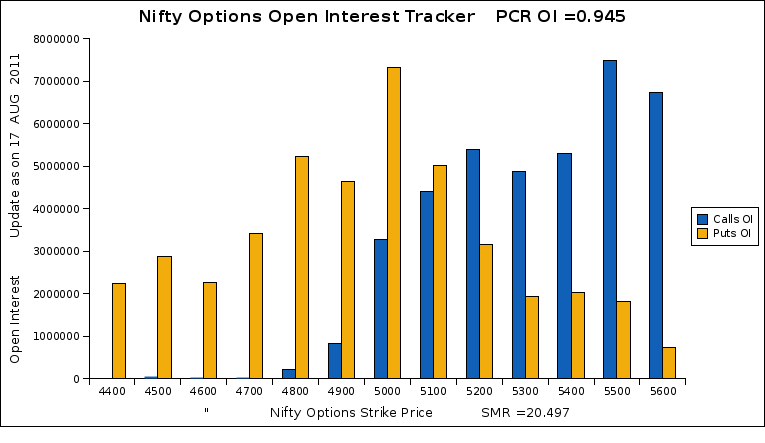 Though all the shorter term indicators are showing sell mode put writers are still confident of holding their higher open interest position for the past 7 trading sessions i.e since 5th August,2011. One can go long with positionally with EOD support zone as 5000-5020. Position should be close if nifty fails to close above 5000-5020 zone on EOD basis. R u sure Raj ?? Short term reversal. Whoever is interested in this system, can write to me at sethufan@gmail.com.